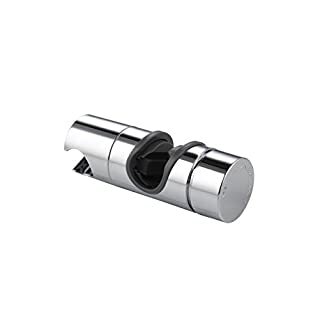 Features: -Showerhead holder is high quality and versatile for shower rod in the standard 18-25 mm diameter. 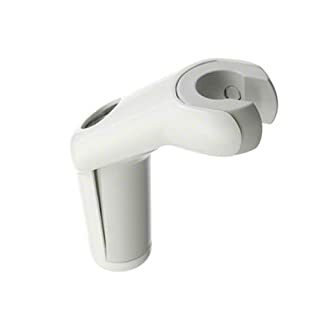 The product is absolutely more stable and more suitable as a shower arm base because of its flexibility. 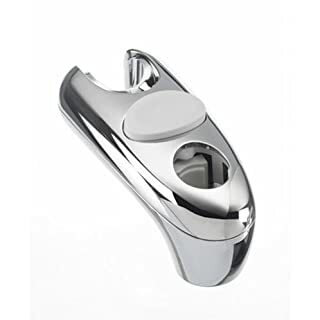 -The shower head holder can be easily and firmly install with shower bar. By adjusting 360 degree to ensure the full range of cleaning, bringing more joy for your shower. 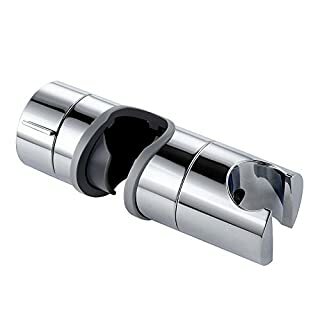 -Beautiful chrome is sturdy, anti-corrosion and anti-rust. It provides you a luxurious bathroom. It is a wise choice to choose this item that can decorate your bathroom. 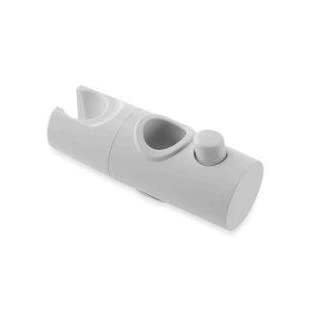 -The highest quality, the holder will not break or compress over time. If you are not satisfied with the needs of our products, please contact us, let us know that we will help you solve the problem. 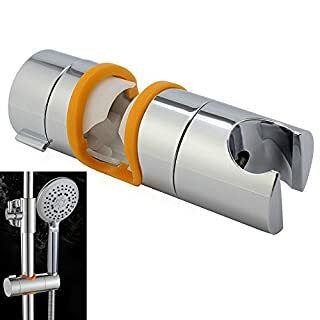 -Hope you have a better shower experience. 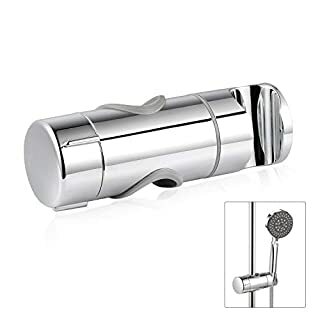 Specification: Material: Engineering grade plastic (ABS) Surface: chrome plated Shower bar suitable for: 18-25 mm Product Size: 14.5 X 11.9 X5.1 cm Product weight: 41g Package including: 1 x Adjustable Handheld Shower Stand Instructions for care: The outside of the bar / shower holder is 18-25 mm diameter. Please do not choose if not in the range. Use alcohol containing ammonia for Cleaning. Note: If the shower will fall, please fix the screw, refer to picture 7. 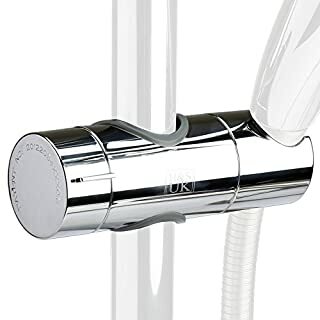 Are you still worried about the instability or rust of the shower bracket?Joyoldelf shower head holder is Chrome Plated, without any issues of rust, and can flexibly rotate within 90 degrees,which is good for your rotation needs and does not rotate at will.With its adjustable diameter to support many shower poles!Features:-Showerhead holder is high quality and versatile for shower rod in the standard 18-25 mm diameter. 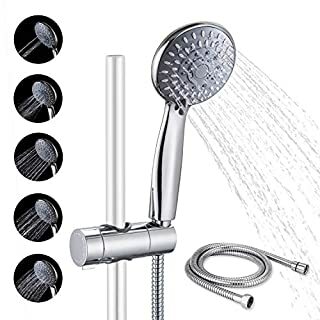 The product is absolutely more stable and more suitable as a shower arm base because of its flexibility.-The shower head holder is 90°rotation, can flexibly rotate within 90 degrees, which is good for your rotation needs and does not rotate at will.The switch for adjusting the bayonet is more slip resistant and easier to adjust.-Beautiful chrome is sturdy, anti-corrosion and anti-rust. It provides you a luxurious bathroom. 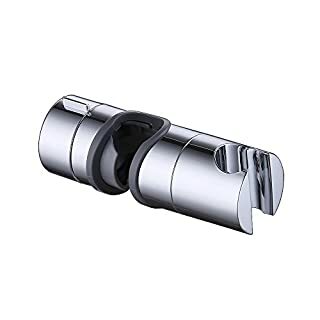 It is a wise choice to choose this item that can decorate your bathroom.-The highest quality, the holder will not break or compress over time. 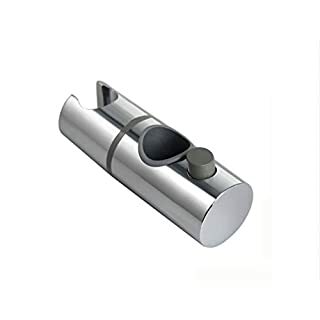 If you are not satisfied with the needs of our products, please contact us, let us know that we will help you solve the problem.Specification:Material: Engineering grade plastic (ABS)Surface: chrome platedShower bar suitable for: 19-25 mmProduct Size: 12.4*4.3*4.3cmProduct weight: 92gPackage including:1 x Adjustable Handheld Shower StandInstructions for care:The outside of the bar / shower holder is 19-25 mm diameter. Please do not choose if not in the range.Use alcohol containing ammonia for Cleaning. 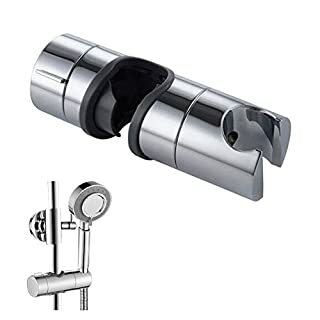 1.Saves renewing whole riser: around £60 for complete rail with no components available separately 2.Once installed it holds all shower head hoses perfectly in place and does no move around when the shower is turned on 3.Beautiful chrome finished 4.Strong holding of the rail and the shower head Material: Engineering Grade Plastic (ABS) Finish: Chrome Suitable Slide Bar: 18-25mm Dimensions of product:20 x 14 x 5cm/ 7.8 x 5.5 x 2in Package Content 1 x Replacement Hand Shower Bracket Warranty 1.The product is under 12 month warranty. 2.Lifetime technical support by Rongle after-sales Team. 3. 30 days money back guarantee: the terms entitle you to a replacement or refund. The most convenient way to renovate your shower brackets. You don't have to remove the hole rail apart from the wall . Simply loose the knob and attach this hold to your rail then tighten. Done. 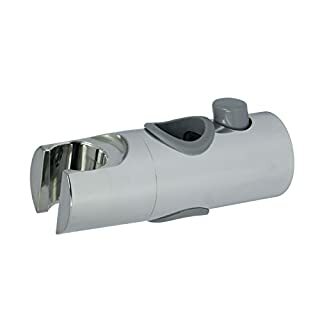 This shower holder is so easily to DIY install , and this shower pole bracket fits probably all sizes(18~25mm diameter of shower rail). It can be adjusted in two dimensions: the position on the rail (height of the slider) and the tilt angle of the shower set. 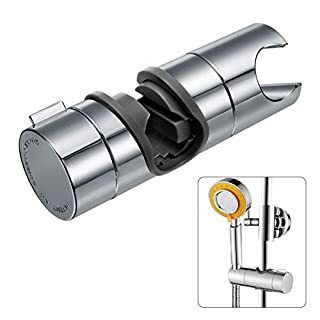 Features Suitable for Diameter 18~25mm shower rail bracket Fix your shower head in place without it slipping Holder end rotates 360 degree, height and angle are fully adjustable. Engineering grade plastic (ABS) constructed, very durable and stable. 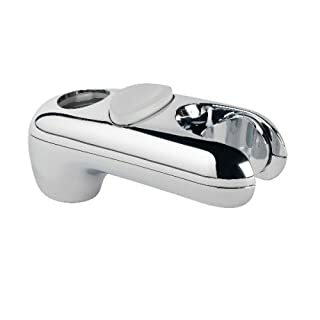 Easy installation,don't need to disassemble slide bar Specification Model: 010-E802-002 Material: Engineering Grade Plastic (ABS) Finish: Chrome Suitable Slide Bar: 18-25mm Product Dimensions: 5.7*4.7*2 inches Product Weight: 5 ounces Package Contents 1* Replacement Hand Shower Bracket Warm tips The outside diameter of slide bar is 18-25mm. Please DO NOT choose one beyond the range. DO NOT use any alcoholic ammonia to clean. If you are not happy with our product for any reasonable requirement, please contact us, let us know and we will help you solve problems. 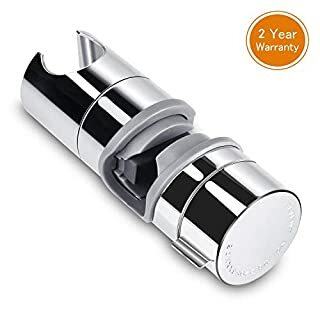 Parameter: Material: Stainless Steel Main Color: Silver Model: JB-S9301 Finish: Brushed Finish Recommended Maximum Load: 11lb Slot Top Diameter-0.87"/22mm Slot Bottom Diameter-0.79"/20mm Suction Cup Base Diameter: 65mm / 2.56 inches Package Weight: 0.42 lbs (0.19KG) Installation Method: Suction Packaged Included: Waterproof vacuum suction cup shower head holder *1 Installation Instructions *1 Installation Instructions : 1. Check to make sure the surface you applied the suction to is clean and smooth. 2. 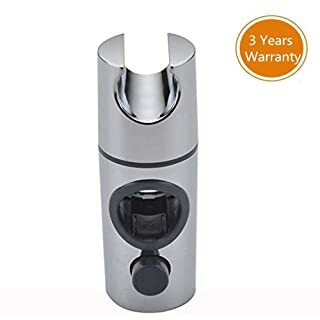 Hold the PVC base, rotate the stainless steel knob cap in an Anti-clockwise manner until it cannot be rotated, make sure the suction cup is in the pre-installed state. 3. Remove the plastic protective film. Make sure the PVC base is dry and clean. Place the suction cup perpendicularly and press firmly to exhaust the air. 4. 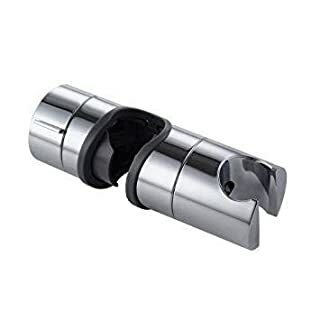 One hand hold the center of the suction cup, the other hand tighten knob cap in a clockwise manner until fully tight to ensure successful installation. 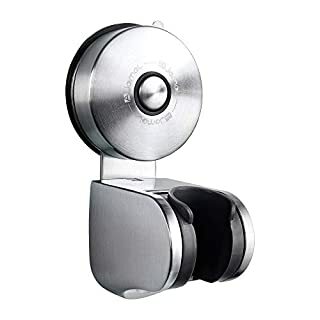 How To Remove: Twist the knob cap in an Anti-clockwise manner until can not rotate. 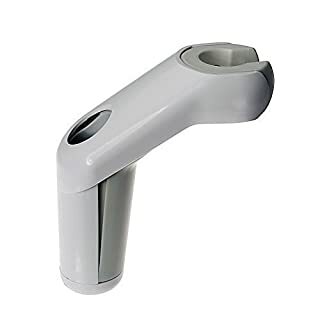 Pull up on the release tab to release the suction and remove. Wash PVC base bottom with water, reuse it after drying. Matters Needing Attention: 1. Suction cup work by the vacuum but the sticky PVC base which can help you place the suction cups easily. 2. Be sure to follow the instructions on mounting. It does make a difference. Search "Suction Cup Series Installation Step" to watch more installation videos on YOUTUBE. And there is an instruction sheet included plus detailed instructions come with the suction.